This article will tell the method to expand system partition space in Windows Server 2008 without reinstalling or rebooting system. Download IM-Magic Partition Resizer Server to increase size of system partition without rebooting on Windows Server 2008. Receive low disk space warning message on Windows 2008 system partition? Need to resize system partition on Windows Server 2008? 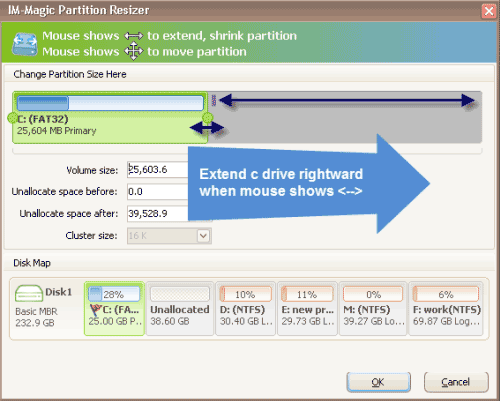 You can use partition software IM-Magic Partition Resizer Server. This partition software works on all Windows Servers including Windows Server 2008 to help resize hard disk. It supports both FAT32 and NTFS partition. By using this partition software, you can extend size of system partition on Windows Server 2008 without losing any data or rebooting your computer. 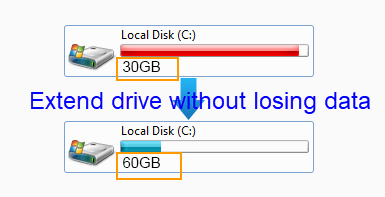 Move the arrows to shrink the selected partition and then you can get some unallocated space. You need to move the unallocated space close to system partition. Then, right click system partition and choose "Resize/Move" option. Move the arrows to add the unallocated space to system partition and then click "Apply" button to get system partition extended. "I have a 20GB system partition on Windows Server 2008 which is running out of disk space recently. Server system frequently reports low disk space warning message on this partition. I am wondering if I can increase size of system partition on Windows Server 2008. Do I need to repartition hard disk and reinstall system in order to extend the system partition?" "I want to extend system partition on Windows Server 2008, bit I have found a useful solution. I tried to open Disk Management but it cannot resize hard disk. Can anybody tell me how to extend system partition on Windows Server 2008? There is lots of important software on the system partition. Do I need to uninstall the software in order to extend system partition? Thanks for any kind help!" When a system partition is running out of disk space, it may have influence on the performance of your computer. In order to prevent your computer from suffering unexpected damage due to low disk space problem, you can resize hard disk on Windows Server 2008 by using partition software IM-Magic Partition Resizer Server. This partition software has the ability to resize hard disk by moving free space from one partition to another. Therefore, as long as there is free space on other partition on the same hard disk, you can move the free space from any of partition to extend the system partition. What you should know is that you can only move free space on the same hard disk. You cannot move free space from another hard disk. This partition software enables you to extend system partition without reinstalling system or rebooting computer. It has not any influence on the operating system or performance of computer by using this partition software to perform partition resizing. You even do not need to reboot the computer to resize hard disk. It only takes a quite short time to get system partition expanded without touching any information on the computer. If the computer shuts download or reboots due to other reasons like power failure during partition resizing, it does no harm to the system or disk. You just need to reboot the computer and perform partition resizing again. When system partition is running on low disk space on Windows Server 2008, you may repartition hard disk and reallocate disk space. However, you need to reformat the partition and reinstall system, so you still need to backup important data before repartitioning disk. However, now with the help of IM-Magic Partition Resizer Server, you can resize hard disk without repartitioning hard disk. You do not need to backup data because this partition software provides a safe way to perform partition resizing without touching any data on the hard disk. This free Server partition magic software is also compatible with Windows SBS 2008 and Windows Server 2008 R2. It supports RAID 5 disk partition resizing too.